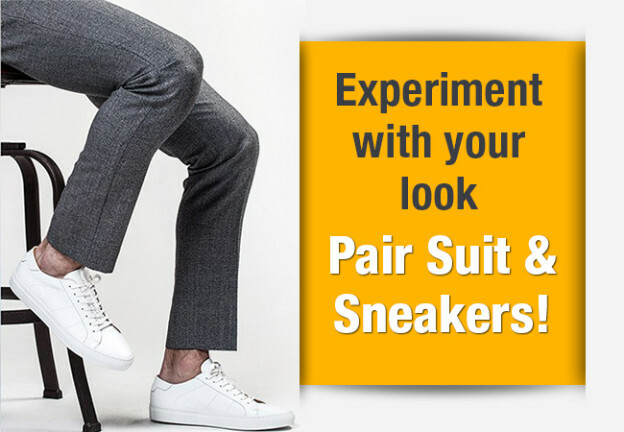 Experiment with your look – Pair Suit & Sneakers! Choosing classic sneakers: everyone style their suit with brogues, Oxfords or monk-straps, but they don't know that even sneakers can add some edge to your outfit. For some time you can forget your focused style and opt for a pair of classic sneakers. Style them with fitted trousers and a structured suit for a sophisticated yet funky look. Wear them all 7 days: Wearing sneakers with suits are always accepted from Mon- Fri if you work in a creative office. But if you ae thinking to retain some finesse of a wearing a formal shoe, then prefer choosing leather sneakers, which appear to be contemporary and refined when styled with a shirt and tie. But on weekends, you can pair slip-ons with a suit jacket and linen T-shirt beneath. Travel Business: when we talk about travel then the combination of structured suits and sneakers goes well, especially when styled with a collared shirt. You can directly go to your client meeting with checking into your hotel. No Black: a burgundy, camouflage or a deep navy print can work good too, rather than wearing black everytime. Sometimes change is required. Wear them to your dinner date or any occasion to show that you are merely comfortable. Confidence is a must: no one is forcing you to wear sneakers with a suit, if you are comfortable and looking for some change in your boring suit then only go for this. But if you are not comfortable, never try otherwise you will ruin your outfit and occasion. Not everyone is submerged to get away with any trend. Gentleman! Go for this look and glam up your style and attitude.